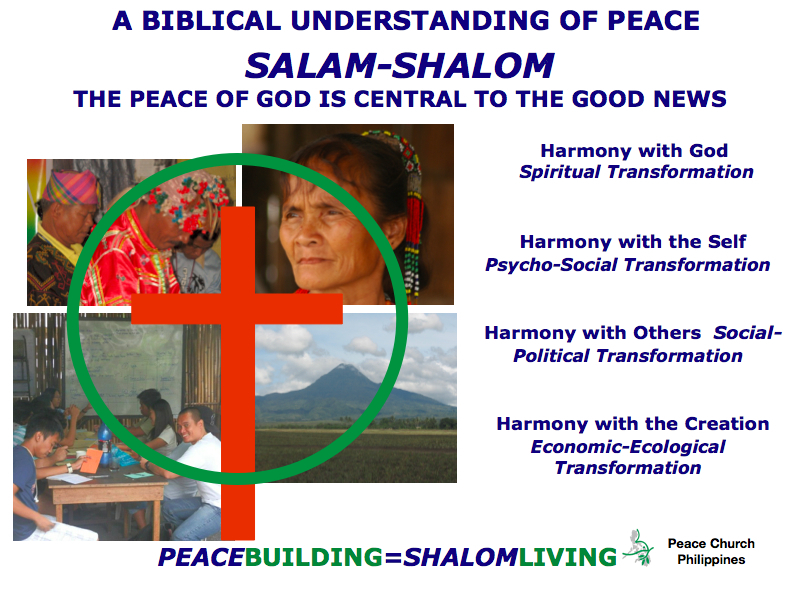 Peace Church starts with Shalom as demonstrated by Jesus of Nazareth! Jesus came and reconciled us to God, one another and all of creation. (2 Corinthians 5:18-21) In Jesus we see God demonstrating how he intended us to live everyday life as humans in communities bringing Peace and wholeness to the world around us. The hebrew word shalom means “completeness, soundness, wholeness and peace.” We understand shalom as harmony in relationships with God, with our being, with others and with the creation. We envision a life where spirituality, community, identity, and economy-ecology are in harmony and connected with each other the way the Jesus of the Gospels demonstrated. Peace Church Philippines understands Jesus’ mission as bringing a kingdom of shalom and so we both demonstrate and proclaim the prince of shalom through actions and words. Since Jesus is the center of the Good News or Gospel to the world, we can’t share the Good News without bringing shalom to the world. Our understanding of shalom is based on the unequivocal declaration that Jesus Christ is the center of life and reality, and that Christ brings the whole creation intact. Peace Church Philippines nurtures our members based on the New Testament hebrew term martyr – a disciple is a martyr-witness. This isn’t about having a messianic complex, a life of adventurism in dangerous places or a search for an extreme religious experience. This is the discipleship of the Anabaptist Martyr-leaders for the past 500 years. This is the kind of discipleship we need in the Philippines! Being martyr-witnesses, first, means that we will love all people unconditionally and will practice selfless love to the point of offering our lives to the people with whom we are called to live and serve. This is exemplified in the humble life of Jesus of Nazareth, whom we follow in response to his sacrificial love. Secondly, by God’s grace, we will not lie. As witnesses to the truth we have experienced in Jesus Christ, we will initiate transparent and honest interactions with all people concerned, as we relate with them and as we formulate and apply our values in daily life and our mission. Thirdly, being martyr-witnesses we affirm that justice is an attribute of God. Therefore, our tasks will be implemented through methods that are just and equitable for all people. Fourth, we will practice genuine forgiveness. Using God’s energy, given to us from his Holy Spirit, we will absorb the violence committed against is so that, like Jesus, we might be used as servants to stop the cycle of violence within us and around us. Finally, Peace Church Philippines will incarnate God’s peace in our lives. As a community we seek harmony and reconciliation with the creator, with our being, with others and with the creation. We believe in solving all problems through non-violence. By God’s grace, mercy and power we will not use any form of violence to manipulate, hurt or kill anyone as a means to accomplish our dreams, mission and objectives. We believe the world is seeking shalom-transformation that leads to harmonious living for all of creation and God the creator has called the church to be the agents of that transformation just like Jesus. I really enjoyed my time reading about what Peace Church do. Those things about peace and love. Yes, we’re God’s warriors, as one of them we should spread the Love and peace that we have received from Him (The Creator -Jesus). Let’s boast our desire to be peacebuilders so that ib due time all of us can experience shalom living. And we will bring praises to God above. Godbless us all. To God be the Glory. Thanks so much for your thoughts! We hope that following Jesus like this is an example to a hurting world that needs hope, and the gospel of peace is a message of hope for all people.